Jephthah speaks when he shouldn’t and doesn’t when he should. For getting these backwards, he kills his only daughter. It all begins after God’s spirit comes to Jephthah, which means that the battle with the Ammonites is decided. But either our judge doesn’t recognize the spirit or he ignores it. When victory has already been assured, Jephthah promises to sacrifice the one who greets him on returning victorious. Of course this isn’t what happens. Instead Jephthah says, “For I opened my mouth to the LORD, and I can’t take it back” (Judges 11:35). And he keeps his promise, which is a pleasant way to gloss over his child’s death. If he’d only been silent earlier or spoken up at the end, we might have even gotten a happy ending. But he didn’t, and we are left with some questions. When should I speak? When should I keep silent? These are questions that we answer every day when we interact with the people we do. I’ve been struggling with them in the past weeks and I don’t think I’m alone. As images and stories of violence and injustice have captured our attention—for the first time or for what is just one more time—many of us, who know how much speech can hurt, are rediscovering just how much our speech has hurt. We struggle with knowing that we have silenced others with our words, and I’ve wondered if silence would be better. But it doesn’t take long to be reminded that silence is also responsible for the injustices we’ve seen in the past weeks, that silence in the face of violence makes us violent too. And I (and maybe we) worry that speaking wrongly will create roadblocks to reconciliation. At the same time, I wonder how we can build and be part of God’s kingdom of justice, peace, mercy, and love without proclaiming them. Jephthah’s story doesn’t give us a universal answer, but it doesn’t let us decide that anything goes, either. So we must ask these questions and we must answer. We must ask the questions again and answer again. And as we answer, we must remember that these are not ultimately concerns for the intellect. They are, first and foremost, questions for our relationships, our communities, and our lives. So as we do we must live the questions again. And we must live the answers again. • How have I hurt people with my words? How have I hurt people with silence? • How can we balance the calls to speech and silence as we build God’s kingdom of justice, love, and peace? As a voluntary act, the vow was not prescribed; even so, vows were regulated. Any vow that devoted persons or property to the sanctuary had to be fulfilled. Provision was made, however, for redeeming the person or property vowed by the payment of appropriate compensation; only in the case of firstling animals that belonged to the Lord was such redemption excluded (cf. Lev 27). There also were vows of renunciation or abstinence, such as fasting or the Nazirite vow. Karen Randolph Joines, “Vow in the Old Testament,” Mercer Dictionary of the Bible, ed. Watson E. Mills et al. (Macon GA: Mercer University Press, 1990), 950. 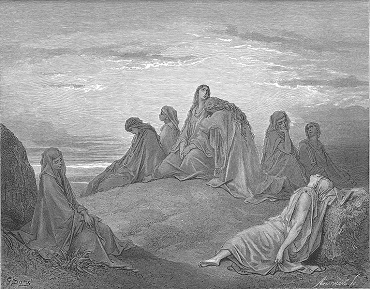 Since the story of Jephthah’s daughter exemplifies the significant premium that Hebrew narrative style places on brevity and suggestive, even provocative, ambiguity, interpreters must pay careful attention to contextual clues and especially to any explicit indicators the narrator has chosen to provide. The immediate context of the story, for example, shapes the reader’s expectations of Jephthah. Jephthath’s default mode of dealing with challenges is through negotiation and bargaining. Further, as already noted, three sequences of unusual relational transactions parallel one another. The Israelites’ repentance motivates God’s change of heart; the Gileadites’ effort to enlist Jephthah elicits only his conditional acceptance of the commission; Jephthah reacts to God’s endorsement of the selection through a vow. In the aggregate, this conditionality produces a dual effect. On one hand, it accentuates an otherwise subtle but theologically significant theme in the book of Judges, namely that, in the Jephthah cycle, God reacts to human decisions and actions. Indeed, in the Jephthah cycle God only reacts to human initiative; at no point does God manifestly direct the course of affairs. The reader can only wonder whether Jephthah would have been God’s choice; an attentive reader will wonder, too, whether God was involved in any way in the vow and the sacrifice. Furthermore, this arrangement highlights Jephthah’s insecurity. He cannot accept the Gileadite overture at face value and in good faith; he cannot trust in the presence of God’s Spirit as evidence of God’s approval and support. Thus, against its immediate context, Jephthah’s unsolicited vow appears to have been entirely unnecessary. Mark E. Biddle, Reading Judges, Reading the Old Testament Series (Macon GA: Smyth & Helwys, 2012), 132.